Getting more horsepower out of a pickup is something that many people would like to do. An increase in horsepower can help to give that little extra power when towing trailers or getting a vehicle free when stuck in the snow. There are many different ways that one can upgrade the horsepower on their truck; however, it is best to stick with a few basic performance installs when they’re first beginning to mod their truck. Cold Air Intake, Performance Spark Plugs, Performance Oil FilterAs far as minor engine upgrades are concerned, most of these can be accomplished by the average auto buff. When the person is changing their oil, they should opt to use a premium performance motor oil with a performance oil filter that has a high compression rate. As far as the spark plugs are concerned, it is an ideal choice to use performance platinum tipped spark plugs; also performance spark plug wiring may also be installed at the same time the individual is changing out the spark plugs.When these minor engine upgrades have been completed, the next step is for a cold air intake it to be installed. 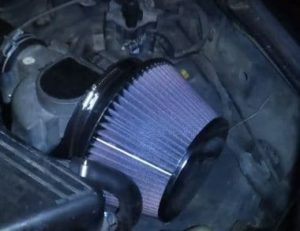 Most cold air intake kits also come pre-equipped with a high-performance air filter as well. This allows more air to be drawn into the engine at a time. There are instructions with every cold air intake kit and the install typically involves a heat shield around the intake or involves installing the cold air intake so that the filter is located below the engine bay and in between the fender well. This ensures that cold air is delivered to the engine for a horsepower boost of three to six horsepower. For more power, one may visit an auto mechanics shop to have a performance exhaust installed for extra power. Additionally, if they would like more engine power, they might also inquire about engine pulley upgrades or even a larger throttle body for more air delivery to the engine. A performance exhaust will allow the engine to exhaust more quickly which allows for an engine that operates more efficiently. The performance engine pulleys are an ideal option to help manage the extra power that the engine will need to be able to handle. This is especially true if the throttle body size is upgraded. A larger or dual throttle body increase the air to fuel ratio by delivering a substantial amount of air which allows the engine to combust fuel more efficiently resulting in horsepower gains.